Several months ago I fell through the floor/ceiling. Well, halfway through. I had torn up the hardwood floor and subfloor of my dining room because cats don’t care what their ruin. Removing everything was a long and dirty process, but the process was coming to an end. Everything was up and I was ready to start laying down the new plywood subfloor. And then, my foot slips off a beam and through the drywall ceiling in the basement. I bruise/crack my ribs (Who knows? It doesn’t matter. The treatment is the same. Let’s go with the less dramatic version of events.) on the beam, which keeps me from falling onto the elliptical machine in the basement. I assume the elliptical machine would have impaled my brain or something, so we’ll call me lucky. There isn’t much you can do for bruised ribs aside from rest. Most anything you do hurts them in one way or another. So positioning the plywood into place was out of the question. Finishing the subfloor was put on hold. I was feeling better about 4 months ago. I didn’t bother finishing the subfloor until last night. The excuse of the bruised ribs rolled itself into a ball and continued down the hill to sitting in bed and watching TV. I had to put off finishing the floor, which led to me believe I could continue putting off finishing the floor. How did I get out of this rut? By writing a blog post yesterday about the plateau of laziness. You see, these blog entries aren’t for you, they’re for me. If they help you out, great! I’m sure you can relate to certain things. But my jump back into the observation of my barriers helped me finish that stupid subfloor. And it felt great. Now for the floor floor. It’ll happen. I think. You’ve probably been on the fence about something for far too long. You don’t want to make a commitment one way or the other. You’re trying to keep everyone happy. But you’re making yourself miserable. If you think you’re not on the fence and you’re feeling miserable, take a harder look. Maybe it’s one of those invisible fences and you’re wearing a shock collar. Make a decision. It’s going to make you feel great. I’ve started using Google Tasks to help me organize what projects I need to work on. I can even have it as a little window on Gmail so I am constantly reminded of what needs doing. Too bad I keep minimizing it because it annoys me. And then I forget about what is on the list. Time to pull it back up and keep it up. There is always someone more (blank) than you, from talented or lazy. For example, I consider myself pretty antisocial. But them I met the lady who reeks of cigarettes and reads a paperback alone at lunch while drinking milk she brought from home in a mason jar. Besides, talent and laziness come in waves. Even if you are the best or worst at something, it’s temporary. You’ll have an off day or a great day. You should probably stop worrying so much about what you are and just do what you do. This isn’t an article about how you should brush away the cobwebs of ideas in your own brain and let the sunshine in as you dig through what has been stored in your head attic. This is literally about cleaning house. I have the next week off of work. And what fun things will I be doing? I’ll be cleaning the house. In the past, I have been unrealistic about similar situations. I thought “I’ll take a week off and get the house in perfect order!” And then I spend two days cleaning and the next three days thinking that I should be cleaning. Thinking about cleaning is stressful. It’s time to get real. I know I’m not going to use the full week to clean. I’m going to make sure I do some steady cleaning for two days, and then a little the next few days in between the playing of video games. There is no use in fooling yourself. Reaching for the stars doesn’t apply to cleaning your house. Want another reason to try out an idea? Too bad, here it comes anyway. It gives you something to talk about. Something that isn’t the weather or what you had for lunch. Don’t get me wrong. “How about that tornado yesterday” is a pretty good piece of conversation. But “supposta be 50 today” is boring. Talk about that what you’re doing! And listen when someone talks about what they’re doing. If folks are bored by what you’re excited about, you have a whole separate issue to deal with. Like, why do you hang out with jerks? I ran a site called Make Me Watch TV for about a year. We’ll go into more detail about that project it in a future post, but I’ll give you a quick explanation of the site now. I allowed strangers to vote on what I should watch every weekday evening. I would then blog about the experience live while on webcam. Pretty simple. Pretty stupid. The site has been a graveyard for a few years, except for the comments section for one post. I was forced to watch a particularly controversial episode of Trading Spouses. The episode gets rerun every so often, and when it does people look for someplace to fight about it. They find my site. It’s at 125 comments and counting. It’s pretty interesting stuff. People start by commenting on how terrible one family on the show is, and end up yelling about the reality of reality television. It’s a peek into the minds of the TV watching and internet fighting populace. And for the Godwin’s law staticians, Hilter was brought up in the 8th comment. I’m not running out of ideas. However, after posting my entry about “blogging every day” (and let’s be real, I meant every weekday) I became concerned that I would run out of things to write about here. But how does that fear help in any way? It doesn’t. I wrote three entires yesterday, and part of me thought about holding on to one post for today. Just in case. In case my brain blanked out. But I didn’t hold on. I let the articles fly and hoped that something would spark an entry for today. Succeeding by holding back seemed like a terrible idea. I could game the system. The system that I set up. If I held back my blog entries, surely I could make posting every day a reality. There is no fun in that though. I’m flying by the seat of my pants and writing as things come to me. I might run out of ideas, but I’m not going to hold back just because of what might happen. So you’ve failed! Who cares? I can’t count the times I’ve said I’ll blog every day, and then haven’t. But I’m trying again. So what makes now different? Everything. Every time you try something, it’s different. That sounds pretty obvious, but let’s continue. Did you continue? Come on. It’s not the longest blog entry. Keep reading. When trying anything again, you’re not starting from scratch. Starting again isn’t like a blank piece of paper with endless possibilities. 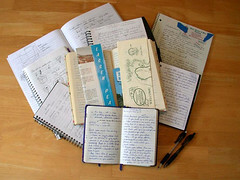 Think of each attempt as the next page in a notebook. There are pages before and pages after. And the pages before show that you’re willing to try. And the fact that you’re on a new page means you want to continue trying. The time is different. The circumstances are different. Maybe it’s a day, a week, or a month later. Maybe you’re busier. Maybe you’re bored…er. Time moves forward, and you’re moving along with it. If there’s something you want to do but haven’t been able to, there’s no shame in trying again. You might make it happen this time. That’d be pretty great. I’m typing this blog entry the day before it is posted. That isn’t cheating, is it? I’m counting it as three days of blog entries. When you’re really good at being distracted by TV and video games, you need to know what you aren’t good at. If you try creating something you know you will absolutely fail at, you’ll probably fall back into a deeper cycle of procrastination and self doubt. This doesn’t mean you should stay away from new and exciting ideas. Simply know and acknowledge your limits. Last night, while falling asleep, I had a vision of a beautiful abstract painting. I observed the painting as it floated in front of my closed eyes. After giving it a fair amount of time in my head, I simply thought “it’s a shame I’ll never be able to make that” and fell asleep. I’m no good at painting. Why waste my time trying to create that, when I already know it isn’t going to turn out? Better to keep myself focused on what I have the ability to do.